After that S3 finale, series 4 opens with Xena seeking to retrieve Gabrielle from the Amazon land of the dead. She remembers her past with Borias and a meeting with a sinister shamen named Alti. DISCLAIMER: No dead Amazons lost their lives during the production of this motion picture. Xena continues her quest to save Gabrielle, and meets a group of young Amazons. 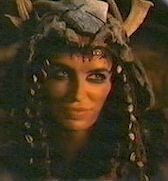 She must defeat Alti to help them and try and find Gabrielle. A trip back to Poteidaia for Xena and Gabrielle(or is it Hope?). However, the family reunions include a certain demon daughter and her little lad, the Destroyer! DISCLAIMER: No spike-skinned, beast-like, incredibly hungry offspring who can't stand the sun were harmed in the production of this motion picture. Guest star: Ted Raimi (Joxer), Timothy Lee (Acestus), Campbell Cooley (Euraylus), Andrew Kovacevich (innkeeper). Xena and Gabrielle get sick. Expect grossness, killer bunnies, lice, foot rot, bathtubs and goat poo! A love it or hate it comedy. DISCLAIMER: No leapin' lice were beaten, whipped, smashed or scratched during the production of this motion picture. Guest stars : Karl Urban(Caesar), Jeremy Callaghan(Pompey), Stephan Lovatt (Phlangus). 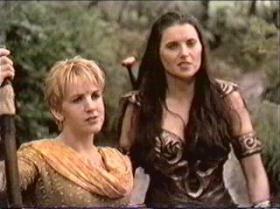 A Roman episode featuring Xena and Gabrielle battling for the greater good against Caesar and Pompey and their armies. DISCLAIMER: No permenant battle scars were inflicted during the production of this motion picture. Guest stars: Bruce Campbell (Autolycus/Philipon the Reformer), Shiri Appleby (Tara), Henri Rudolf (Telamon), Michael Kupenga (Andros), John Givens (Istafan). A dancing episode(!) directed by Michael(Iolaus) Hurst, that has Xena and Gabrielle helping a town where dancing is oulawed. Tara- that nice girl from "Forgiven"- returns. Baddie-with-worst-outfit winner appears. DISCLAIMER: No self righteous Magistrates intent on surpressing the basic human right of freedom of expression were harmed during the production of this motion picture. Guest stars: Katrina Browne (Thelassa), Tanae Heke (Ursena), William Kircher (Bad Guard). Name change for this one- formerly known as Shark Island Prison. Xena is sentenced to life in prison for a crime she committed in her dark past. That fetching sack- last seen in The Debt is back. DISCLAIMER: No rabid, flesh eating crabs were cooked during the production of this motion picture. Guest stars: Kathryn Norris (Najara). Xena and Gabrielle meet up with a female crusader named Najara, on a quest of her own who may not be all she appears. 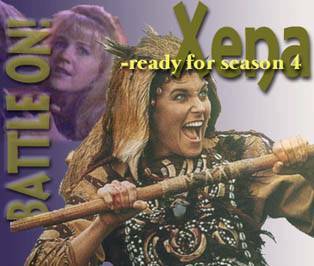 Xena has a series of flashbacks in which she recalls military exploits from her evil past...which echo the strategies attackers are using on a town she's defending. The birth of Solon and the death of Borias in this one. 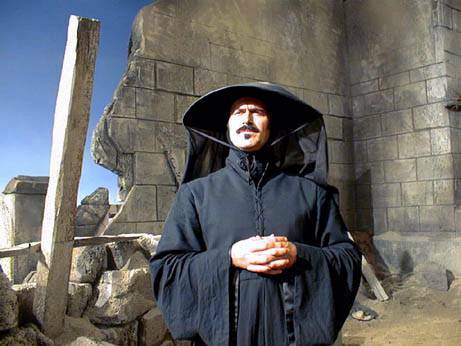 Guest stars: Bruce Campbell (Autolycus), Ted Raimi (Joxer). One of the first episodes filmed, this one is a "Raising Arizona" type romp with Meg, Joxer and Autolycus involved in a stolen baby case. DISCLAIMER: No priceless porkers of either organic or ceramic origin were harmed during the production of this motion picture. Guest stars: Beth Allen (Pilee), Mandy McMullin (Adiah), Bruce Hopkins (Rahal), Craig Ancell (Milo), Watchman Rivers (Cirvik). 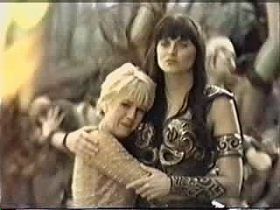 Xena and Gabrielle return to the scene of Xena's battle with the Horde and try to rescue a girl who may be their captive. Of course it turns out not to be that simple. Xena, Gabrielle and Joxer try to persuade a young runaway princess to return home by telling her their version of Cinderella. Sweet comedy. DISCLAIMER: No fractured fables were harmed in the production of this motion picture. Gabrielle's paradise could be Xena's hell! Fantasy, Alice in Wonderland type episode which features more mysticism, and some snazzy costumes for Gab, plus THAT bath scene and massage! DISCLAIMER: Paradise was found but not necessarily embracced during the production of this motion picture. DISCLAIMER: In memory of woman's best friend; Bear, Dodger, Kali, Samantha, Taffy, Bear. Alti returns in this tale of reincarnation and the battle between good and evil. 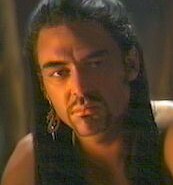 Another of the Indian episodes that has Xena enlisting the help of Krishna to save Gabrielle and Eli from the demon Indrajit. After being banned due to a protest by a radical Hindu group, a slightly amended version means it is back! This disclaimer was removed from the revised version of this episode. DISCLAIMER: Any similarities between Hanuman and a major character in the motion picture classic Planet of the Apes, is purely coincidental. Gabrielle is persuded to write a play of one of her scrolls by a con woman. 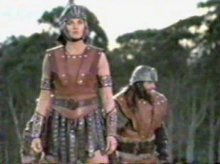 Auditioning potential "Xena"'s and "Gabrielle"'s while trying to write the right sort of play is Gabrielle's challenge in this Lucy-lite episode. DISCLAIMER: Although no great literary works or art were harmed or plagiarised, a fw thespians stole some scenes during the production of this motion picture. 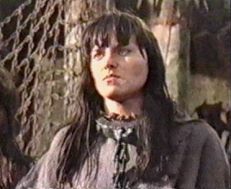 Najara returns in an episode notable for Joxer's first kill. A really good one with lots of Xena and Gabrielle angst thanks to the trouble maker Najara, and the first ever serious Joxer episode. A murder mystery, as friends and family gather at Cyrene's in for a surprise birthday party for Gabrielle. When a woman is found dead, Xena must uncover the killer even if it is one of her friends. Xena and Gabrielle return to the Amazons where tragedy strikes and they are plunged into conflict with the Romans. DISCLAIMER: Xena and Gabrielle were killed during the production of this motion picture. Renee O'Connor directs for the first time!! Set in the present day, Lucy Lawless plays a woman convinced she was Xena in a past life! Ted Raimi plays her boyfriend and Renee O'Connor the past lives therapist she sees. You'll have to watch to see Kevin Smith as I don't want to give it away! This is a photo of my mum. Just thought I'd put it here! !